Your support helps amazing students succeed at UMBC. Over the next few weeks, we’ll be sharing some of their stories with you. 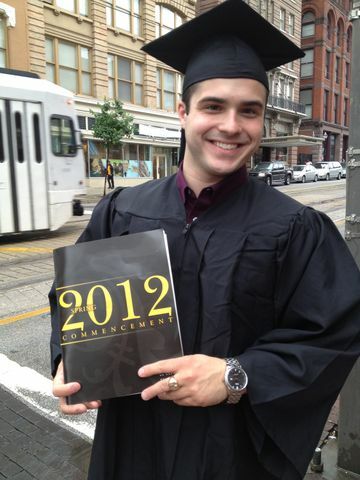 This week, meet Jeremy, a proud member of the Class of 2012. Jeremy Brickey will be recognizable to this fall’s incoming freshmen: he was one of the faces of the “UMBC Superheroes” ad campaign. And Jeremy made his time at UMBC “super” by being involved in many facets of campus life. He is a member of the rugby team and on the rugby executive board; he was the president of the Sigma Alpha Epsilon fraternity, and won the UMBC Greek Man of the Year award in 2010. A Linehan scholar, Jeremy was published in Bartleby, UMBC’s literary magazine. In addition to being a “superhero,” Jeremy reached out to prospective students as a student ambassador and worked as a Woolie to help incoming students. As the 2012 Student Alumni Association founder and president, Jeremy will continue to make his mark on UMBC long after he graduates. “I can’t begin to tell you how thankful I am for what I have been given. Without my scholarships, I would not have fallen in love with the poetry of Marlowe or Donne, or taken acting classes, or had the chance to help launch a student alumni group at UMBC. Without the caring support of donors, I might have missed out on moments that truly shaped me as a thinker. Brickey credits the people of UMBC with helping to open his eyes to many a new idea, and knows UMBC will remain a part of his life for years to come. Help support student scholarships and other great projects at UMBC. A Community of Supporters: UMBC Thanks You!